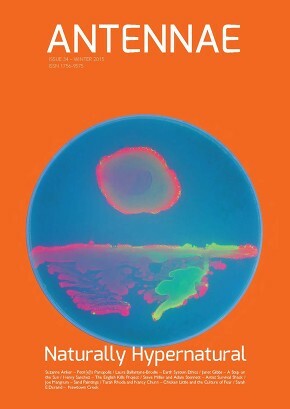 This is the second of two issues of Antennae titled Naturally Hypernatural after a conference organized by Suzanne Anker, (Chair, BFA Fine Arts Department at the School of Visual Arts New York) and Sabine Flach (Chair, Department of Art History at the University of Graz). Naturally Hypernatural: Visions of Nature investigated the fluctuating ‘essences’ of ‘nature’ and the ‘natural’ in the 21st century. At the present time, cellular parts are being remixed in laboratories to create synthetic organisms while geological transformations are forecasting wild swings in weather conditions. Human reproduction regularly occurs in Petri dishes while cucumbers are grown in space. The artificial and the natural now combine to form novel entities, never before seen on earth, while animal species dwindle down to extinction every day. Animals and plants are exhibited as contemporary art, while the real is conflated with the imaginary. This issue of Antennae and the previous gather a selection of papers presented at the conference. As part of the journal’s year-long exploration ‘beyond human-animal studies’ which began in March 2015 with the publication of the first of two installment titled Multispecies Intra-action, Natural Hypernatural‘s contribution further problematizesthe new philosophical and recent artistic approaches to the possibility of viable posthumanist models.The redefinition of the concepts of ‘natural’ and ‘artificial’ which so much characterize the Anthropocene are in these two issues embraced by each author in different and original ways. Here, anthropocentric systems are not replaced by zoo-centric ones. Authors thus attempt to grapple with different links and elusive networks between different species, spaces, organisms, and technologies. The artistic repercussions that ensue from this reconfiguration of the traditional object/subject relationship are ripe with new and exciting potentialities. The Journal of Nature in Visual Culture.